Live your dream of owning a condo in the luxurious BGC or driving your new car with PSBank - Hello! Welcome to my blog! 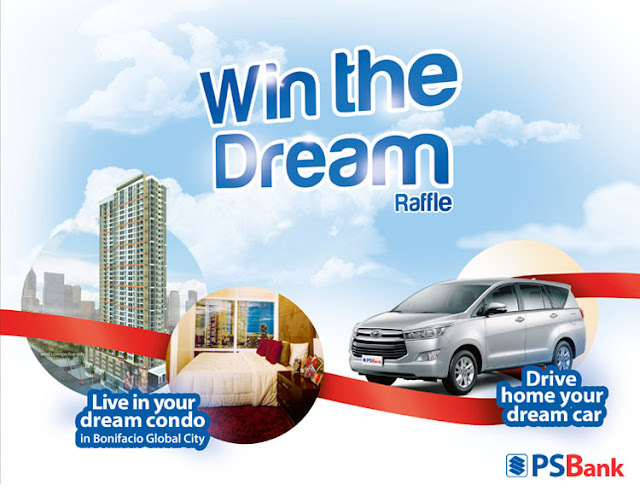 Get a chance to win and live your dream of owning a one-bedroom condominium at Park West in Bonifacio Global City or drive home a brand new 2017 Toyota Innova J DSL M/T in PSBank’s “Win the Dream (57 Treats)” raffle promo. In celebration of our 57th anniversary, we are also giving away five (5) Samsung 43” UHD TVs, 10 Samsung Tab A with S. Pen, 20 Samsung GLX J5 Prime mobile phones, and 20 Gift Vouchers. The “Win the Dream” raffle is open to all new and existing individual or joint deposit clients of PSBank. To earn a raffle entry, simply maintain at least a Month-to-Date (MTD) Average Daily Balance (ADB) of PhP50,000 in your PSBank Peso Checking or Peso Savings account or USD1,000 in your PSBank Dollar Savings account from June 1 to November 30, 2017. You will earn more e-raffle entries for every PhP50,000 or USD1,000 additional deposit in your account. The higher the ADB, the more chances of winning. All raffle winners will be drawn electronically on December 14, 2017; 5:00pm; at the PSBank Head Office in Makati City. To know more about this promotion, visit: www.psbank.com.ph and click on the Best Deals>Promos Tab. PSBank is a key player in the Philippine consumer banking industry. The Bank emerged as the 2nd strongest bank in the Asian Banker's AB500 annual ranking 2016-2017 edition. PSBank is the only savings bank that has consistently cornered a spot in the list of the top 10 strongest banks in the country for six consecutive years. We have expanded our network to more than 250 branches and more than 600 ATMs nationwide.